2018 was a big year for the Scrum Master with Glassdoor describing the importance of the role and LinkedIn listing Scrum Master as one of the most promising jobs of 2019. Slowly, the Scrum Master has moved out of the world of geek to mainstream acceptance. And that is not a surprise. More and more organizations appreciate the importance of agility, to be able to respond more rapidly to ever changing market conditions. That move to agility requires a change to the way in which teams are managed, how work is structured and the very relationship between the people doing the work and the organization they work within. The guide to this change is the Scrum Master. 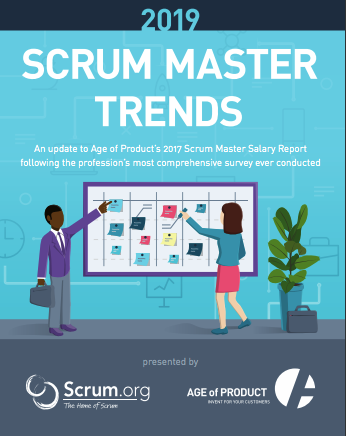 The 2019 Scrum Master Trends Report is an update to the 2017 Scrum Master Salary Report that Age of the Product conducted in 2017. By partnering, we have secured a larger sample and broadened the reach of the research, growing from over 500 to more than 2,100 respondents and adding more geographies and a broader set of demographics. We also expanded the questions asked, adding questions on scaling, agile change, reporting structures and practices. It is hard to pick my favorite bits. The whole survey report is worth a read, but here are some of my key takeaways. With 45% of Scrum Masters surveyed saying they were the people kicking off the agile transition it appears that organizations are looking to this role to lead change in their enterprise. This supports the very vision that Ken Schwaber and Jeff Sutherland had when defining the role of the Scrum Master as the person that brings Scrum and agile into the enterprise. It also highlights how we are seeing a focus on bottom up change rather than the traditional top down approach. Not saying that you do not need to create an environment where change can happen from the top, but the actual work is being done within the teams and products where the change is required. This is a very positive situation as change that comes from those doing the work is often more likely to succeed. Again, because of the increased importance of agility it should not come as a surprise that scaling is on the rise with 50% of people surveyed saying they are using a scaling framework. 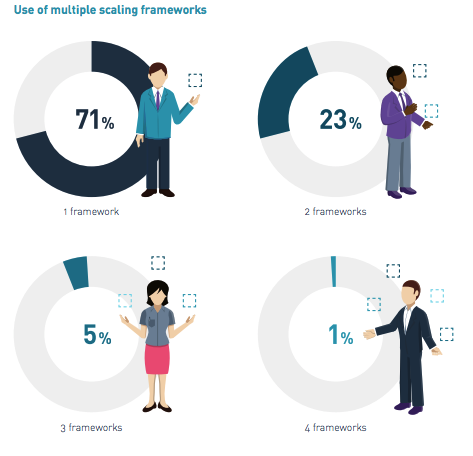 What is interesting is the use of multiple frameworks with 29% of responders saying that they use more than one framework. The reality is that scaling is hard, and practitioners need to look to many different frameworks and ideas to define an approach that works for their situation. Scaling really does highlight that one size does not fit all. Nexus for example does not provide guidance on portfolio management, LeSS provides much information in that area. It is important that practitioners gather ideas from many bodies of knowledge understanding the implications of using a particular idea. Scaling ultimately does require compromise, but that compromise should not be done without thought. Any dogmatic approach to scaling is problematic and likely to fail. With the growth of Scrum and agile ideas, the Scrum Master role is also growing and maturing. The survey highlights that a third of respondents have over 3 years of experience in the role. This is consistent with what we are seeing at Scrum.org with the increased number of students attending the Advanced Scrum Master class and taking the PSM II assessment. Of course, we are still a long way from a very mature discipline, but we are starting to see the change in more mature markets such as the Netherlands, parts of the US and Western Europe. Supporting this statistic is the growing maturity of organizations with 43% of respondents saying that their adoption of Scrum is growing. The fact that Scrum Teams were using Kanban was the motivation for Scrum.org to develop the Professional Scrum with Kanban class so it is no surprise that the survey supports this with over 80% of respondents saying that they were using Kanban with Scrum. Scrum is a framework that requires teams to adopt the right practices to make it work within their problem domain. Transparency and the ability to inspect and adapt is a fundamental requirement of Scrum. Kanban provides a great set of practices to help teams do so. Ok. I would say that assessments and certification is a key part of the empirical learning strategy at Scrum.org, but honestly the numbers do not lie with only 15% of responders earning over $100K a year without a formal certification. Of course, certification alone does not make for higher wages, formal training and education is critical too. 50% of respondents who make over $75,000 annually have formal Scrum training while only 6% of those in that same range do not have formal Scrum Training. But don’t take my word for the survey results read them yourself and draw your own conclusions. And if you have any questions about the data please reach out as we continue to develop our understanding of the Scrum Master role and how it is helping to change the world. You can access the full report here.